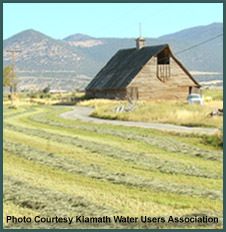 The ultimate vision for the Klamath Basin DSS is the development and implementation of a comprehensive set of information sources (i.e., data) and tools (i.e., applications) implemented within a web environment, capable of assisting a broad audience with resource management decisions. The audience envisioned includes private landowners, the business community, interested citizens, tribal governments, local government, non-profit organizations, and state and local governmental agencies. A considerable portion of the information provided through this DSS is already available in various forms, within the public domain. The unique aspect of this DSS, is the integration of these data in a manner that can be used to reach decisions. The Advisory Committee (AC) organized by Klamath County to guide the development of this DSS identified "data transparency and quality" as an important issue early in the development process. The issues articulated by members of the AC were that users of this DSS should be able to access the original source of the data, understand potential limitations of the data, and be provided guidance to assist with the interpretation of the data to reasonably avoid misinterpretation and misuse. Data and transparency are provided through direct links to the source data. A minimum requirement for providing data is metadata and a description of how the information was created. The use of various standards, including Web Map Service (WMS), Web Feature Service (WFS), Web Coverage Service (WCS) and other related standards recognized by the Open GIS consortium are strongly encouraged to minimize data management and maintenance costs. If you have information you wish to share through this DSS you may contact Lani Hickey at the Klamath County Public Works Department (lhickey @ co.klamath.or.us). Several tools are envisioned for implementation through this DSS and are described by the Use Cases within Functional Requirements Document. Tools presently under development include the MapViewers, a Water Supply Forecast Tracking Tool, and a Watershed Restoration Tool. Future potential tools include an Upper Klamath Lake Elevation Forecast Tool and improved water supply forecast tools specific to water use and environmental flow requirements.